The Archers is the world’s longest-running radio soap opera. The British production, which has aired over 18,600 episodes, is broadcast on Radio 4, the BBC‘s main spoken-word channel. Originally billed as an everyday story of country folk, it is now described as a contemporary drama in a rural setting. Five pilot episodes were aired in 1950 and the first episode was broadcast nationally on 1 January 1951. A significant show in British popular culture, and with over five million listeners, it is Radio 4’s most listened-to non-news programme. With over one million listeners via the internet, the programme holds the record for BBC Radio online listening figures. The paper will explore attitudes to education and educational participation and achievement in The Archers through the lens of gender and class. There has never been a teacher in the cast of the Archers. The nearest is Jim, but as a retired Classics professor, he is something of a parody. Does the Archers have a problem with education? Attitudes to education and to the choice of future career are largely determined by class. There’s the split between the cathedral school and the state school. 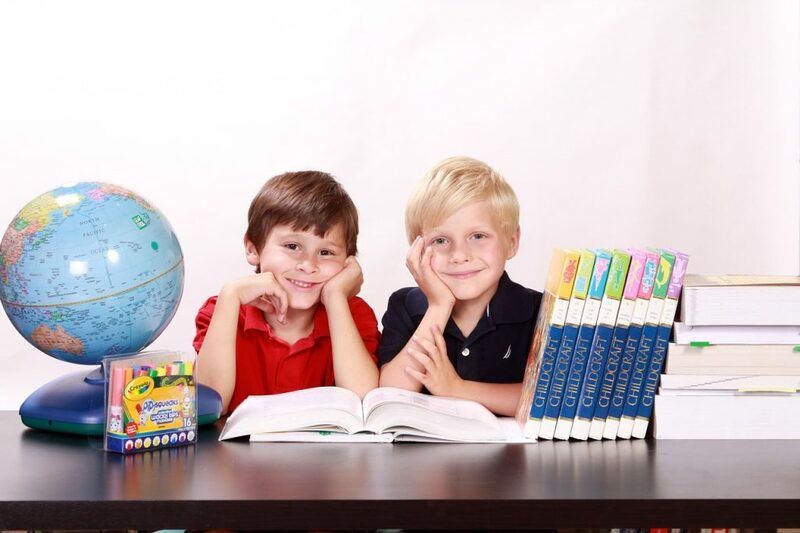 Shula and Elizabeth’s kids attend the Cathedral school, the Brookfield children the other. Ruari is so precious he is a boarder – too good for the Cathedral school? Higher education remains a relative rarity in Ambridge. Phoebe, Alice and Pip are the exceptions, although the Fairbrother’s rugby playing background suggests they too may have attended university. Apprenticeships are for the less academically able, such as Johnny. Parental background largely accounts for choice of career. Few offspring have flown the nest to a completely new occupation. Indeed, it is notable that Ambridge still lacks a single person working in Information Technology. And what of children with SLD? The only child with Down’s Syndrome was ‘removed’ from Ambridge to the big city to better meet her educational needs despite educational policy promoting integration in local, mainstream schools? The question is to what extent The Archers reflects changing attitudes to education in rural areas of the UK and continuing divisions through class and gender? Both Jenny Hughes and Graham Attwell are lifelong Archers listeners. They work for Pontydysgu, an educational research organisation based in Pontypridd. Their research includes the training of teachers, the use of technology in the classroom and careers education. 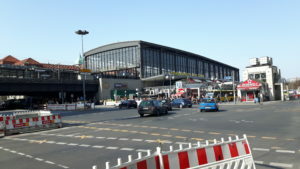 With my two previous posts I have been writing a series of blog entries on my recent visit to Berlin – the ‘second home town’ of the mid-1990s when I was working at Cedefop (European Centre for the Development of Vocational Training). 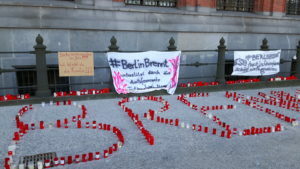 My motto is the same as that of other alt-Berliner who long for getting back – “Ich habe noch einen Koffer in Berlin“. 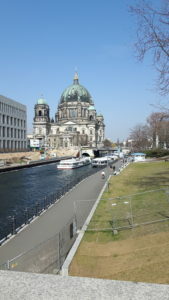 In my previous blogs I have told of my sightseeing rounds – walking in Berlin – and of my encounters with friends of old – meetings in Berlin. But now it is time to come to the highlight of the visit and tell the reason for being in Berlin during those sunny days. I was there to attend a concert that was announced as “Paganini-Marathon”. 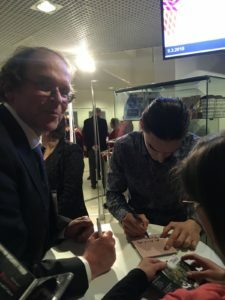 I have reported in my blogs of December 2017 how I got enthusiastic of classical music at the Kuhmo Chamber Music Festival in June and how I have followed a brilliant multi-instrumentalist Sergey Malov after the festival. But perhaps it is worthwhile to recapitulate some points of that story before going to the concert of Tuesday the 10th of April. Well, how did it all start and how did it develop further? 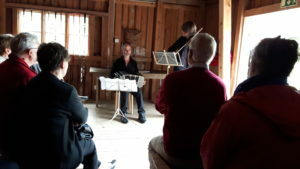 For many years I have been going to Kuhmo to listen chamber music because my beloved Johanna has always been a passionate fan of classical music. We had been shuttling ourselves from the neighbouring Sotkamo (frome Johanna’s home grounds). I have enjoyed the music as well but when we have been attending just a few concerts, it has not made that great impact on me. But in summer 2017 we decided to give us a treat – to take the weekly tickets for both two weeks and to get the accommodation from the centre of Kuhmo – walking distance from the concert venues. And that gave us an entirely new perspective for experiencing the Kuhmo Magic. In my blogs of December I have told, how I got into conversation with Sergey Malov on his use of special effects in his Paganini concert in Kuhmo (which reminded me of a special scene in Emil Loteanu’s film “Lautarii”). And when we both had found the film on YouTube and shared our impressions, we had more themes and I was happy to follow Sergey’s other concerts and his performances in the Salakamari (“The seceret chamber”). Below we see firstly Sergey performing with Klaus Mäkelä and Antti Tikkanen. In the second photo we see Alberto Mesirca performing with Daniel Rowland. In the third photo we see Marcelo Nisinman performing with Daniel Rowland. 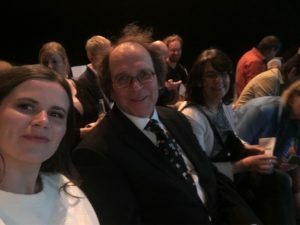 Such experiences made all the difference when compared to the previous years – we all were residents of the “Kuhmo planet” and it was very easy to for music-lovers to start a conversation with artists who were around. And we enjoyed the “Kuhmo cocktail” provided by the festival program. 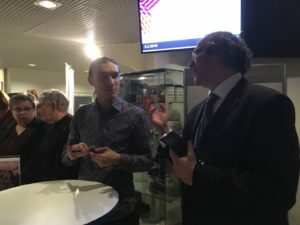 Then, finally, in the beginning of March I had the chance to attend the next great concert of Klaus Mäkelä and Sergey – this time in Tampere (my old home town) and in the concert hall Tampere-talo (next to my old university). This was an opportunity not to be missed. And I managed to get the young hobby-violinist Karita from our family circle to join me in the concert. So, there we were, firstly listening to the warm-up talks before the concert hearing all kinds of things about the pieces of music to be played. But we heard also of Sergey’s sport exercises on the ice of the lake Näsijärvi during the week before the concert. And we had a discussion on the role of violoncello da spalla in his forthcoming concerts in Kuhmo and Kuusamo (further North) in the following week. Unfortunately there is no video recording of these talks nor on the concert. But it was great to listen to Sergey playing Stravinsky. During the intermission we had a chance for catch-up talks with Sergey and I told him that I would come to Berlin as well. And Karita was happy to get the record “Hommage à Ysaÿe” signed by Sergey as a belated birthday present. Then it was the time for the ‘Paganini-Marathon’ in Berlin. To be sure, we knew that Sergey had produced a great record as “Hommage à Paganini” and an equally great video “Paganini live” in addition to the trailer of the video. So, many of us knew what to expect. 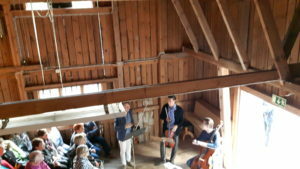 Also, the guitarist Alberto Mesirca had played nicely Paganini cantabile with Daniel Rowland in an interesting location. Altogether we all in the audience, in particular Maria Lazareva from Moscow, my ex-colleague Alison from Berlin and myself were overwhelmed and stunned of what we could see and hear. And the encore – Henri Vieuxtemps’ Capriccio for Viola – was completely disarming us. There was no other response to that than a standing ovation – and all the others in the audience felt in the same way. We enjoyed very much and we hope that the video that was recorded will be edited for public viewing. At the end of the concert we noted that there was no restaurant or cafeteria in the same building or in the neighbourhood that could have accommodated us for some kind of group talks after the event. So, most of the audience faded away while I was getting the CDs signed by Sergey. And suddenly we were only a small group of family members, musicians, support team members – and me. I was very pleased that Sergey and Anna could host our little group at their place. And we had some nice talks on music, technical support, films and videos as well as other topics. 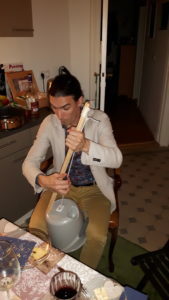 And in the middle of all that Sergey presented us yet another instrument and explained how it works. Here we only have a still image of it (on Instagram Sergey has uploaded a video with sound.) So, at the end of the day there are no limits to creativity when our top artists are concerned. Altogether, we in the audience were happy with what we had experienced during that evening. I guess this is enough of the background and of my impressions on the concert. After the event we in the audience were overwhelmed, stunned and speechless. Gradually we are getting our impressions together. But it would be a great thing to get a video recording of this magnificent concert to refresh the memories. We are looking forward to it and to the next concerts of our musicians. In my previous post I started a series of blog entries focusing on my recent visit to Berlin and on the chances to refresh my memories from the mid-1990s when I was working and living in Berlin. My motto is the same as with many famous artists who have left Berlin and long for getting back – “Ich habe noch einen Koffer in Berlin” – as the old song tells us. In the first post I told you how I was dealing with my luggage of memories while walking around Berlin and seeing the well-known sights. In this second post I shift the emphasis to meetings with friends and colleagues of old time – many of which I had not seen in 15 – 20 years. So, there was a lot of sharing and catching up with different groups of good friends. In my first lunch meeting the venue itself was part of the memories. But let us begin from the start. I had met Sabine Manning already during my first weeks working at Cedefop. then in Berlin. I knew of her research interests in comparative educational studies. In particular I knew that she had studied initiatives that ingrate general/academic and vocational learning into dually oriented qualifications (Doppelqualifizierende Bildungsgänge). When Cedefop – my employer organisation – moved from Berlin to Thessaloniki I got the chance to monitor an accompany European cooperation projects. This led to a long-term cooperation with Sabine who was leading a set of such projects and my beloved Johanna (who became my partner in life) who was leading another set. This cooperation was continued in the annual ECER conferences and in the VETNET network for European research in vocational education and training. 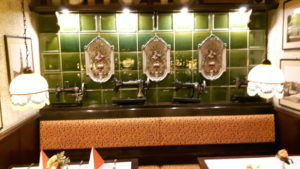 So, coming back to the restaurant “Mutter Hoppe” – this old-styled restaurant at the Alexanderplatz had served as a meeting point for me, Johanna, Sabine and her husband John some ten years ago. Since then we had mostly contacts via phone and e-mails, but not via face to face meetings. 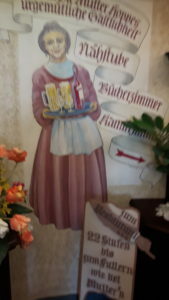 So, this time it was very convenient for us three to meet at Mutter Hoppe (and keep Johanna present in our talks). To some extent we discussed the recent news of the VETNET network (to which Sabine contributes via her mailing list and newsletter) and the forthcoming events. But as family friends we shared a lot of family news. I told of our experiences working as expatriates (me in Bremen, Johanna in Tampa, Florida). And we had a lot of news to share of the adult children pursuing their careers as expats, returners or home-bound. And of course we talked about grandchildren. So, we had a nice lunch in a very convenient location (see photos of the restaurant) that I totally forgot to take photos of ourselves. Another meeting took place on the same evening after I had been walking around in Berlin (see my previous blog). This meeting was agreed with two friends of old (including their spouses – also good friends of old), but they had managed to spread the news and some more friends came along. So, we were a nice group – just like a “Klassentreffen” (a school class reunion). And here again, the venue was part of the memory. 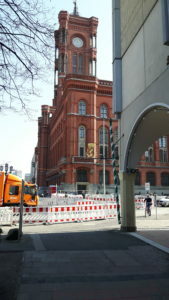 The restaurant “Hellas” was very close to the building of Cedefop (European Centre for the Development of Vocational Training) when it was located in Berlin. (Now I was surprised to see that the building serves as the cultural department of the embassy of a non-European country.) 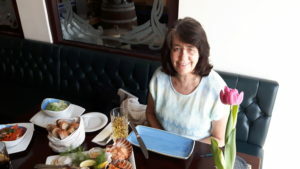 And given that Cedefop (and me with my employer organisation) had moved to Thessaloniki, I was pleased to refresh my memories of Greece in a Greek restaurant. Thinking of my friends who were there, I had learned to know Gerhard Zimmer already during my first visits to Germany 1989, 1990 and 1993 and he had visited Finland in 1990. And during the years 1994-1995 we had a lot of sharing knowledge and experiences, including leisure activities involving also his wife Brigitte and my daughter Paula (who visited me in Berlin every now and then). At thar time Gerhard was working in the Federal Institute for Vocational Education and Training (BiBB) in Berlin. After my years in Thessaloniki I had a chance to bring a group of vocational teacher educators to Germany in the beginning of the year 2004 and then we visited Hamburg, where Gerhard was now a professor in the Helmut-Schmidt-Universität. Again, it was a good encounter with several common themes. With Reinhard Selka my cooperation started shortly after the move of Cedefop to Thessaloniki. On top of my duties in research cooperation in the field of vocational education and training (VET) I had taken a temporary responsibility on the project ‘Teachers and Trainers in VET’ since the earlier project manager had left Cedefop. During the transitional period Reinhard (as the expert on ‘training of trainers’ in BiBB) was a great help and a great friend as well. During our cooperation in this period I was happy to receive him in Thessaloniki and to visit his place in Berlin. His spouse Monika with her Greece-expertise was a natural ally in these talks. And it was a great experience to attend the concert of the Dubliners in the Tempodrom tent (next to Haus der Kulturen der Welt) with Reinhard, Monika and my son Antti (who was at that time a teenager). When handing over the transitional responsibility on that theme ‘training of trainers’ our cooperation came to an end and shortly afterwards Reinhard retired from BiBB. With Johannes Koch I got acquainted in the same conferences as Gerhard Zimmer and as the neighbour of Reinhard. Johannes had been for a long time a prominent representative of accompanying research (Begleitforschung) attached to pilot projects (Modellversuche) in the field of VET. Johannes had been the prominent promoter of pilots with self-organised learning supported with instructional scripts (Leittexte) and analysed the importance of appropriate working & learning tasks in the field of VET. With Johannes our cooperation went further, including my first years in the ITB (when we were in charge of promoting networks and consultation processes across Europe). With Bent Paulsen I had been in cooperation during the early stage of the European action programme Leonardo da Vinci. Bent had become the head of the Leonardo coordination unit in BiBB and I was working my way into the realm of European cooperation. Our discussions in Berlin (before the move of Cedefop) and afterwards, during my visits to Berlin, gave me a lot of support and solidarity. So, altogether we were like a group of classmates after many years’ break. And just continuing from what we had had as common topics, we managed to pay attention to critical incidents. But, after all, I hope that the picture above has been appropriate and yet appreciates the contribution of the expert musicians from wherever they come. In this meeting we got ourselves into a special feel for Greece that it merits to be presented below. And here again, we forgot to take photos. So, here we come! As a compensation of the photos, let us take as a common denominator our interest in Greece and Greek culture and let us call Maria Farantouri to express that! My final meeting of this type was with my former Cedefop colleague Alison Clark (from Scotland, but a real Berlin oldtimer) and her husband Gerd Romeike (a native Spandau inhabitant). 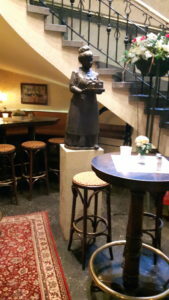 I had learned to know Alison as the cheerful coordinator of the Cedefop translation service and as the natural meeting point hostess for the afternoon tea for the more or less British tea-drinkers in the Berlin time. After the move to Thessaloniki the afternoon tea break with Alison’s teapot helped us to put away with all kinds of monor inconveniences of the beginning period. And when we started to get settled, Gerd was also seen there as a frequent visitor to join the family of Cedefopians. Also, with Alison I got involved into the Caledonian society of Thessaloniki as a quasi adopted Scotsman and that was a great musical and cultural experience. After my temporary contract in Cedefop came to an end my friends among colleagues prepared a special farewell song to me – “The melting snowman” – and Alison and Gerd were involved there as well. So, after all these years, it was a great pleasure to have a private catch-up after they had left Thessaloniki behind and got both settled to Berlin. Indeed, there was a lot of talk on Berlin, Thessaloniki and friends of old – as well as of experiences of travelling around the world. And I was happy to get Alison with me to join my main activity during this Berlin visit (see my next blog post). 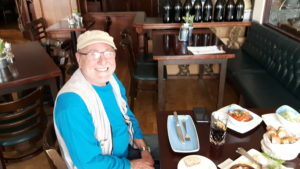 We had an enjoyable lunch session at a lakeside restaurant Raymons in Spandau and as they were both shining in the photos. Good for them! I think this is enough of these meetings and of the magic of being back in Berlin with friends of old – as if the years in between had not been there and as if it had been just a couple of days since we met last time. This was very encouraging and empowering. Yet, the best of all was to come after these encounters – but that is a topic for another blog entry. “Ich habe noch einen Koffer in Berlin” (I still have a piece of luggage in Berlin) – this is the way that old Berliners express their longing for getting back to the home town they have left behind. The first one (if remember correctly) to record the song was Marlene Dietrich, and many others have done it after her. I am not a singer but I share this feeling although my time in Berlin was relatively short – from June 1994 to September 1995. But that was long enough to get familiar with the mega-city consisting of different kinds of districts (Bezirken) that had once been independent municipalities. And the history of Berlin (East and West) has left its traces, as well as the unification and the rebuilding and remodelling of the capital of the unified Germany. So, now that I had a chance to spend three days in Berlin, I got back to my luggage of memories just like Marlene Dietrich in her song. 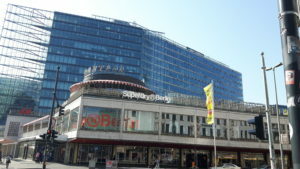 So, now that I had quite some spare time, I was there again, walking in Berlin and visiting the sights of the centres. 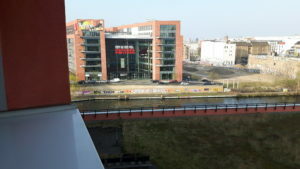 I started from East Berlin, since my hotel was there (for reasons to be told later). 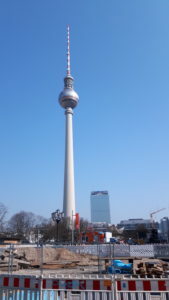 And the obvious point to start was the Alexanderplatz (‘Alex’, as the locals call it). During my years in Berlin it remained pretty much the same as it was after the unification, but major changes were to come in the near future. So, the central buildings of the DDR-regime were to be demolished and completely new buildings were to be built, in particular due to the move of the capital city (Hauptstadtumzug) that was still on its way. Now, most of that rebuilding work had been done, but yet there was quite a lot of construction work going on around the Alex. This can be seen from the photos that I took there. What we don’t see any longer in these pictures, is the former parliament of DDR, Palast der Republik, also called by some locals as “Erichs Lampenladen” (Erich’s lamp boutique) due its luxurious lighting from inside and outside. 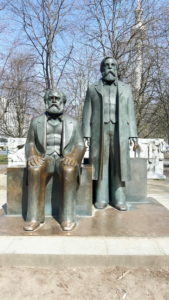 But, as we see it, the respectable fellows Karl Marx and Friedrich Engels are still there and observing, what all is going on. 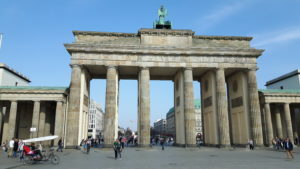 Probably the best way to get a feeling for the history of Berlin and for the critical moments is to proceed from Alex via the Berliner Dom to the main street Unter den Linden up to Brandenburger Tor (the Brandenburg gate) and to the old parliament building Reichstag. When moving between the gate and the old parliament building one cannot help thinking, how deeply the years of separation and the wall between the two parts had torn the people apart from each other. 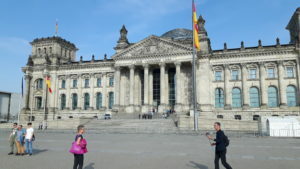 Here some photos of the Dom, Brandenburger Tor and the Reichstag. But, to be honest, at the time when I was working in Berlin, most of us (me and my colleagues) still perceived the centre of West Berlin as the real and living centre of Berlin. And accordingly, the Kurfürstendamm (or shortened as Ku’damm) counted as the main street for business and tourists. 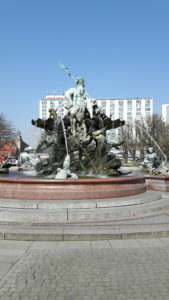 The centre of East Berlin (Mitte) was perceived more like the historical centre that was a bit out – or to some colleagues very much out (as the phrase ‘jott-wee-dee’ meaning ‘janz weit draussen’). Now, visiting shortly the central places of West-Berlin, I got the impression that that part is now being squeezed by the new buildings and the ongoing construction work. 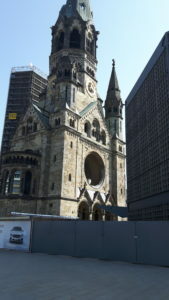 Obviously, the railway station Bahnhof Zoo and the ruin church (Gedächtniskirche) with its memorial building remain as clear landmarks. But the legendary Kranzler-Ecke – and the cafeteria that gave the name for that corner – have been squeezed into minor diminutives. Well, times – they are a-changing – as we know it from the old song. Ach weh! So many memories are creeping to my mind just when writing this and adding the photos. But I guess this is enough for this blog post. In my next post I will give insights into the meetings with friends of old and how we refreshed our memories when having lunch or dinner together. In my two recent posts I focused on historical anniversaries that coincided on the 27th of January – the very day to remember the victims of holocaust (liberated from Auschwitz) and the beginning of the Finnish civil war (1918). Having written these two posts I thought I would retreat to my usual themes on ‘working & learning’ – research and development in the field of vocational education and training. But when I woke up this morning, I understood that we had yet another historical anniversary that merits our attention – 70 years from the death of Mahatma Gandhi. As I have heard very good contributions from the German radio channel Deutschlandfunk, I do not want to repeat their message but rather share them via my blog. Also, the German TV-Channel ARD has provided a good photo gallery of Gandhi’s life and life work. So, below I share the links and hope that the pictures and the texts speak for themselves. This link takes you to a series of 14 photos from different phases of Mahatma Gandhi’s life. The religious program “Morgenandacht” early in the morning discussed a lesson that Gandhi gave on valuing the ‘least’ of us in the humankind. I think this is enough for the moment. I hope that the pictures and the texts (in original language or as translations) convey the message. To me these already presented a lot of the wisdom and courage in peaceful mind that was exemplified by Mahatma Gandhi. With my previous post I started blogging on historical anniversaries related to the date 27th of January. 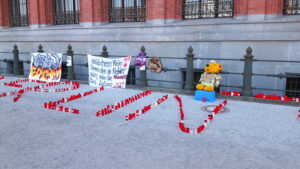 My first blog focused on remembering the victims of holocaust. In Germany the date of the liberation of the Nazi concentration camp Auschwitz-Birkenau (27.1.1945) is the Day of Remembering of the Victims of the Nazi Regime (Gedenkstag der Opfer des NS-Regimes). With this post I discussed the importance of such remembering in the present times when antisemitism, xenophobia and racism tend to creep forward in the social media and in the everyday language. In this respect I brought forward contributions of German media with emphasis on learning lessons from the dark times. In a similar way I would like to deal with the 100th anniversary of the beginning of the Finnish civil war (27.1.1918). The Finnish civil war – what was it all about? Last year and the year before I was pleased to blog on the special year in the Finnish history – the preparations for the 100th anniversary of the Finnish Independence Day – the day when the Finnish parliament approved the Independence Declaration. Shortly afterwards the independence was recognised by the revolutionary government of Russia, led by the Bolsheviks and V.I. Lenin. This was celebrated by all political groupings in Finland. BUT the political and social life was in turmoil and the conflicts escalated into a civil war. Nowadays the studies in the Finnish history, complemented by investigative journalism, have provided much information on the developments that led to the national tragedy. Paradoxically, Finland had profited of the presence of Russian soldiers and navy during the World War I (whilst Finnish people were not recruited to the Russian army). The fortifying works and the supply of army had provided income and employment for Finnish people. When Russia collapsed in military and economic terms, this was a heavy blow to the Finnish economy – and suddenly the condition of working people became worse. At the same time the police forces (maintained by the Russian government) were abolished and this caused immense problems. As a consequence, both the bourgeois parties and the labour movement started to create their own guards – which then started to live a life of their own. Also, with the common goal – to gain independence – there were controversies between the political parties: Who is really promoting it and who is collaborating with the Russian elite? In January 1918 the bourgeois-led Finnish government declared the ‘white guard’ as the government troops and ordered the disarmament of the remaining Russian troops and of the ‘red guard’. At the same time the government left Helsinki and reassembled in the city of Vaasa. The disarmament order led to fighting and to the decision of the red guard of Helsinki to start an armed resistance. This was followed at different parts of the country – but soon it became clear that the red guards dominated mainly the southern (and more industrialised) parts of Finland whilst the white guards dominated the central and northern areas. In March and April the white guards with better military leadership and better resources got the upper hand. In the crucial battle of Tampere the military strength of the red guard collapsed. And the subsequent invasion of German troops to the Helsinki area strengthened the final offensives of the white guard. As usual, transition from civil war to peace and to normality is not an easy process. And in Finland in the year 1918 this transition was far from peaceful. Already during the civil war there had been numerous atrocities in different parts of the country. Now, after the military victory, the revenge was merciless. Mass executions, catastrophic circumstances at prisoner camps and an atmosphere of mistrust and discrimination overshadowed the whole year. However, the fact that Germany lost the World War I, gave rise to changes in government and brought up more reconciliatory tendencies into government policies. Yet, the wounds were deep and it took long to heal them. Coming into terms with the experiences of the civil war – how has that happened? In the light of the above it is understandable that the political climate remained very polarised through decades. From 1939 to 1945 the involvement of Finland in the World War II put the defence of the independence and the survival struggle of the Finnish people on top of everything else. In the post-war reconstruction there were tendencies towards consensus and towards polarisation. However, the recovery of the damages and the resettlement of a large population evacuated from the areas that were lost to Soviet Union – all this had the priority. Once the reconstruction got further, there was firstly a need to deal with the more recent experiences of the World War II. On the one hand this happened via ‘war stories’, in which the bravery of Finns was celebrated. But on the other hand another kind of reflective literature emerged – something similar to Tolstoy’s ‘War and Peace’ or to Hemingway’s ‘To whom the bells toll‘. The leading author of this wave was Väinö Linna with his taboo-breaking novel “Tuntematon sotilas” (The unknown soldier), published in 1954. As Linna himself said, he wanted to value the Finnish soldiers and their survival struggle but not the war itself. And as a result, there was a highly controversial debate, whether he did justice to his country and the struggle. At the end, he gained huge popularity and the film, based on his novel, is nowadays part of the national identity of the post-war Finland. After this experience the country was ready to deal with the older wounds. And again it was Väinö Linna, who opened the discussion with his novel trilogy “Täällä Pohjantähden alla” (Under the North Star) in the 1960s. In this trilogy he reconstructs the Finnish history before the independence, the critical years of the independence movement and of the civil war, the tensed period of the 1920s an 1930s, the years of World War II and of the post-war recovery. The venue is the rural village of Pentinkulma that serves as the focal point for presenting what happened and what the local people thought of it. Given the success of his previous novel, Linna presented a new perspective to the civil war and to the years after. With the help of his trilogy – and the films based on it – the new generations learned to overcome the ‘white’ and the ‘red’ myths of the civil war. It became apparent that it was not a war between ‘the good’ and ‘the bad’ but both sides had blood in their hands. And it became apparent that the years after the civil war kept the suspicion and tension alive. In the long run, the nation learned to leave the hatred behind – although not much was done to find the truth and to ease the reconciliation. What has happened later on – until the current anniversary? In the decades after the 1960s the Finnish economy became prosperous, the Finnish society was adopting a variant of a welfare state -policy and the political life was overcoming polarisations. Thus, the antagonisms of the 1918 were now longer lived as a part of the actual political culture. Yet, it was only in the 1990s and after the year 2000 when professional historians took major efforts to clarify in depth, what all happened in the year 1918. More detailed studies were published on different aspects of the civil war and a comprehensive database was gathered on the victims – included the ones killed in action, by atrocities, by executions, by starvation or diseases in the prison camps. Moreover, this also brought into picture new kinds of novels that researched the fates of particular personalities or – in a bigger picture – the role of women during the national tragedy. And this gave rise to theatre pieces that presented these aspects in different parts of Finland. Finally, with the help of the Finnish broadcasting corporation YLE, a new campaign for collecting memories of the tragic years – either those of eye witnesses or those of their children – has led to a richer picture of the dark period. On top of this, the 100th anniversary (of the beginning of the civil war) coincided with the presidential election in Finland. It was remarkable to see that the candidates of different parties could discuss the tragedy of the past in an open way – and it appeared that the relatives of the candidates had been on different sides. Yet, in the present date Finland this didn’t trigger attempts to replay the old antagonisms. Instead, the discussion took the course towards learning the lessons from the difficult past. The conflicts of interest and different world views should never bring the people to such a situation again. I guess this is enough of these historical anniversaries. I will now return to my usual themes. Normally I am writing on this blog about my work as researcher in vocational education and training (VET) and on learning experiences while working with practitioners in VET. However, as we all know, researchers and educators are not working in a societal vacuum. Therefore, issues of social awareness and social responsibility are always there to be considered and discussed. And historical anniversaries trigger such discussions in the media and in public debate. Yesterday, two historical anniversaries were ‘celebrated’ with such discussions – one at the international level and another one in my home country Finland. I will start with the Day for Remembering the Victims of Holocaust and the Nazi Regimes. What does the the Day for Remembering (Gedenktag) stand for? As an expatriate Finn living in Germany I have got used to the German culture of remembering the atrocities of the Nazi regime and showing solidarity to the victims. Many TV-channels show documentary films that give insights into the dark history and into the role of different societal actors who were involved. One of the peak points has been the 27th of January – the anniversary of the liberation of the concentration camp Auschwitz-Birkenau – the very place where the industrialisation of genocide and mass murders was brought to perfection. Indeed, years and decades have passed from those dark days. Therefore, some people may think that one could leave that sad past behind. Some people may think that one could take a different view on the German military past – as if it were something separate from the genocide and mass murders of civilians of that time. 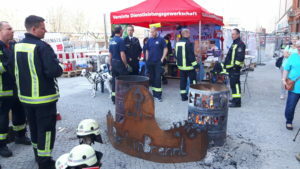 And furthermore, migrants are coming to Germany from such areas in which the remembering of holocaust is not present. This all has now been brought into discussion – once again – by the news updates and commentaries on the Day of Remembering. Below I have selected some examples that emphasise, how and why we need to keep the culture of remembering alive and ready to respond to whatever challenges. This report informs of an exhibition of the last letters of holocaust-victims to their relatives. It makes transparent the human beings and human lives that suddenly became victims of a brutal terror regime. This is an interview with the leading Jewish rabbi in Paris. He reflects on newer tendencies towards antisemitism, xenophobia and racism in Europe. But he also emphasises the achievements of intercultural education in promoting solidarity and understanding between people with different cultural backgrounds. I think this is enough of this historical anniversary. To me it is important that the message of remembering and understanding is passed forward. As the Prime Minister of the German Federal State Thüringen, Bodo Ramelow has formulated it: “Never again means never again!” The lessons from the history have to be learned. 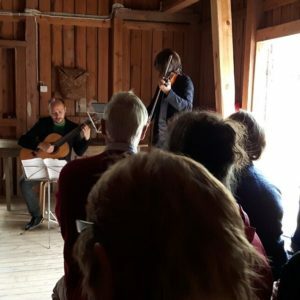 In my two previous posts I have reported on my/our cultural highlight of this year – the Kuhmo Chamber Music Festival, July 2017. This was a shared experience between my partner Johanna (who has been a regular visitor since the early days of the festival) and myself (a latterly joined ‘avec’ who has learned to appreciate the festival). In my first post I told of the background of the festival and provided insights into the highlights of the Kuhmo 2017 program. In my second post I told of the meeting point ‘Salakamari’ (Secret chamber) and of the early morning lectures by artists in this pop-up restaurant and conference room. Indeed, my Kuhmo experience this year changed me from a passive sympathiser to an enthusiastic follower. I needed to learn more of this great music played by this great artists – who pointed out to be very nice fellows in the Kuhmo neighbourhood. For various reasons my follow-up ‘project’ has mainly focused on the music and video performances of Sergey Malov – Meister Sergey, as I prefer to call him. Below I will present some main points what I have found of him in the internet and what I have learned of him. Another film production with the same Danish film crew from the Louisiana Modern Art Museum gave Meister Sergey and his French counterparts, the composer Guillaume Connesson and the pianist Jerome Ducrot, a chance to demonstrate, how cultural boundaries can be crossed. In the video interview Meister Sergey gives insights into the development of Connesson, his capability to combine French traditions and American influences. Sergey analyses the exemplary piece of music – The Songs of Atlantis by Connesson – to be played by him and Ducrot together. At the same time the film crew equips the musicians and their instruments with numerous cameras to detect their movements – their Handwerk – while playing. In this way, the theory of music, the aesthetic performance and the technical mastery have all been made transparent. I think this is enough of the learning journey that I have had after the Kuhmo event. I notice that I have not mentioned the records of Meister Sergey or the video recordings of his concerts. More information is available on his website http://sergeymalov.com/ or on his professional facebook page. As far as I am concerned, I have learned a lot with this follow-up of the magnificent Kuhmo experience. And with this blog post I wish you all a happy Christmas time and a good slide to the new year 2018!